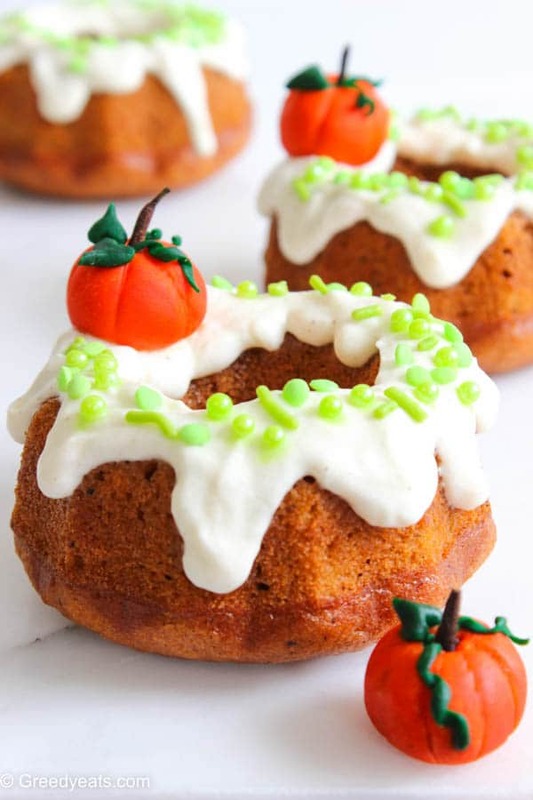 Pump-kin yourself up with this moist and light mini pumpkin bundt cake recipe covered with a silky and smooth cream cheese icing! Easy pumpkin cupcakes recipe to keep you warm in those chilly fall days, piled high with a soft and light cream cheese frosting. Loved how roly-poly these turned out! Though I have to admit,it was such a time consuming task. Specially, those small curly greens on pumpkin top. But looks like the prettiest thing on earth and tasted absurdly delicious! Time to get back to what you are here for. How do you make homemade pumpkin cupcakes! Well these are the easiest homemade cupcakes that you will ever make. One bowl to make the cupcake batter. No mixers required! Sift dry ingredients over wet, fold, pour in liners and bake. Can’t get any easier! I baked a half batch, 6 cupcakes. Pranay and I polished them off in two flat days. If I had made 6, pumpkin swear, they wouldn’t have lasted any longer! Now when you half/double a recipe, you can’t use half/double of every ingredient. BAKING SCIENCE ALERT! At times you have to amp up leaveners, adjust liquids in the batter sometimes and add more extracts the other times. I have increased vanilla and spices for that shining pumpkin flavor! SOFT AND LIGHT: All thanks to that deliciously gloppy pumpkin puree, eggs and right amount of leaveners. 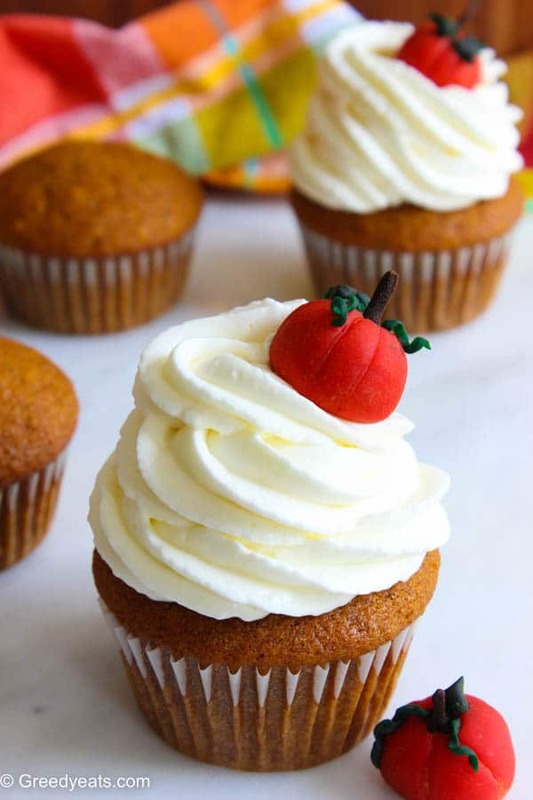 FILLED WITH WARM SPICES: Now I love spices in my pumpkin cupcakes to a higher side. You will still taste pumpkin, promise! Try adding large pinch of black pepper and some cardamom in the pumpkin batter. And you will have this fall classic redefined. SILKY AND SMOOTH FROSTING: Using four basic ingredients leads to a soft, silky and absolutely pipeable cream cheese frosting. Adding maple extract would be so good here, but it also makes the frosting a little thin. It will still hold some shape though! Or you can just top a dollop of maple cream cheese frosting on the cupcake and swirl it with the back of a spoon. Lovely rustic finish! Skip lightng cinnamon flavored candles, those fall hayrides, Jack-o’-lantern but don’t miss out on these easy pumpkin cupcakes this season. Follow me on instagram for more such drool-worthy dessert recipes! And tag #Greedyeatsblog if you make these cupcakes. Seeing your creations, makes my day! 1. Preheat your oven to 350 deg F and line a muffins pan with 6 paper liners. Set aside. 2. Whisk together egg, pumpkin puree, oil, vanilla and both the sugars in a medium bowl. Combine them all really well. 3. Sift all the dry ingredients-flour, baking powder, baking soda, salt and all the spices over the wet ingredients and gently fold to combine with a spatula. Do not over-mix. 4. Pout the batter in the pre-prepared liners and bake for about 20-22 minutes. Let the cupcakes cool completely before frosting. 1. Beat the butter until light and fluffy for about 2 minutes using an electric mixer/beater. 2. Add cream cheese and vanilla and continue to beat for another 2 minutes. Gradually add sugar and keep beating till a smooth frosting like consistency is reached. Add salt and mix it in. 3. Frost the cooled cupcakes (I used Ateco #827 tip) as desired. I like a lot of spices in my pumpkin cupcakes, you may adjust the spices to suit your taste. Frosted cupcakes stay good for a few hours at room temperature. For a longer storage, keep them in refrigerator for upto 2 days. Unfrosted cupcakes freeze well for 2 months. Thaw them in the refrigerator or on the counter before frosting.